PFLUGERVILLE, Tex. (WLS) -- A young Texas boy gave his life savings to a local mosque that was vandalized in what police are calling a hate crime. The Islamic Center of Pflugerville, a suburb of Austin, Texas, was vandalized early Monday with torn pages of the Koran, which were smeared with feces. 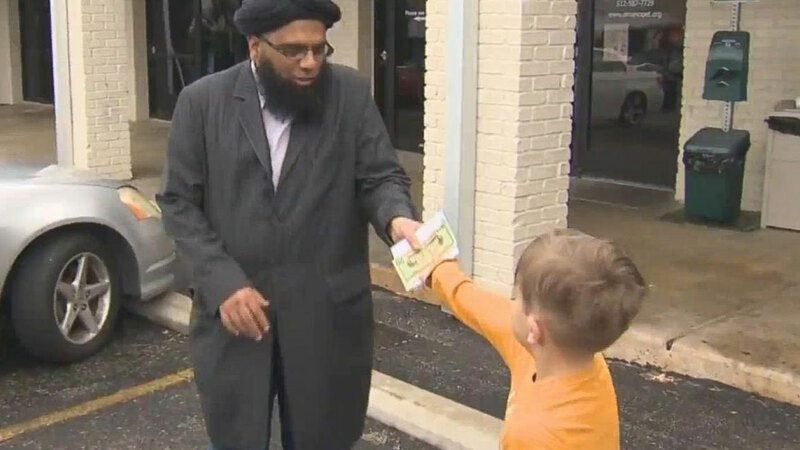 7-year-old Jack Swanson went to the mosque that afternoon to hand over the contents his piggy bank - mostly pennies - to help the congregants clean up. "Jack's $20 are worth $20 million to us because it's the thought that counts," mosque board member Faisal Naeem told ABC News. "Jack is just a little older than my son, Ibrahim. If we have more kind-hearted kids like them in the world, I have hope for our future." Jack's mother said the boy wanted to help out and show that "what happened in Paris is not what's happening in Pflugerville." Naeem points out that there's no direct evidence that the vandalism was connected with the Paris attacks, but lamented the "generalizations" that are often applied to Muslim communities after extremist attacks. "It's become so commonplace where something goes wrong somewhere and people want to blame all Muslims," he said. "If anything, it's a pointing indictment of the logical fallacy in our society's way of thinking." No physical damage was made to the mosque, but clean-up costs are expected to be about $150. Naeem said that he was encouraged by the community's support, and that flowers had replaced the damaged pages of the Koran by Monday night.